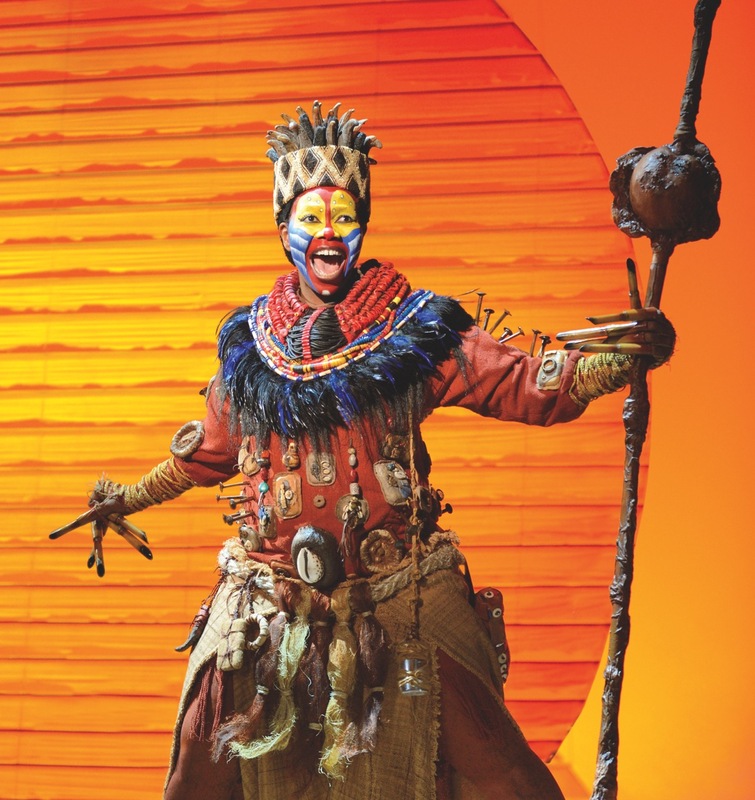 The pinnacle of artistic collaboration, the stage musical of The Lion King takes the colourful characters, heartwarming story and catchy songs from the movie, and elevates them immeasurably with state-of-the-art lighting, scenery, costumes, puppetry and masks,. 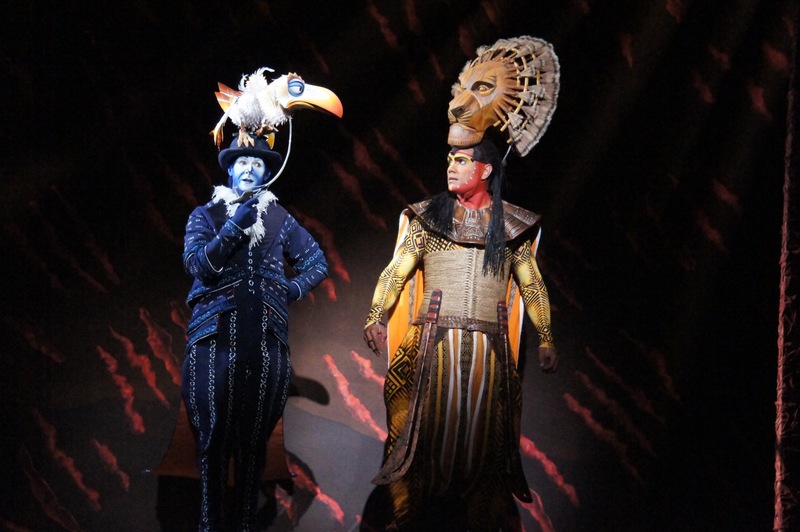 As crafted by Julie Taymor, the director, costume designer and mask/puppet designer (with Michael Curry), each creative element is inextricably linked so as to paint a cohesive whole that shimmers with beauty. In a triumph of substance over style, the beating heart of the story, characters and setting transcend the gasp-inducing wonders on display. Showing great respect to the source and setting, Taymor created a world of rituals, traditions and social hierarchy in which the animals and the land are connected as one. The mighty land is as dangerous as it is beautiful and bountiful, but the greatest danger comes the abuse of power and mismanagement of resources. Far from hitting us with a heavy-handed environmental message, Taymor weaves the concept naturally into the show. The African experience is further enhanced by the pulsing beat of additional songs and music by Lebo M, which capture both the pain and joy of the characters. 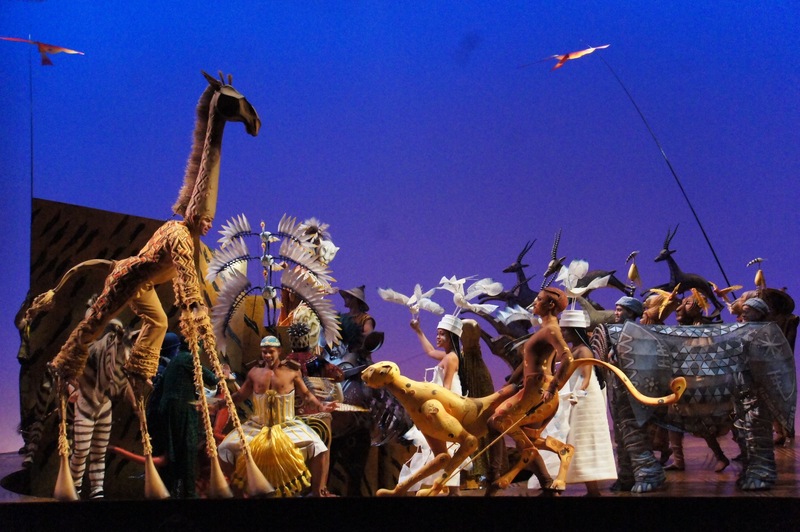 Taymor sets aside the animal puppets for several eruptions of joy featuring actors dressed in the glorious colours of traditional African outfits. Garth Fagan’s choreography, drawing from the full vocabulary of dance, is an integral part of the delight. The combination of this spiritual music with the cute, perky movie songs by Elton John and Tim Rice should not work but somehow it just does. Perhaps it is due to the mix of music by John and Hans Zimmer in the movie. A note on the score: purists need to be aware that the John/Rice song “Morning Report,” written for Zazu for the stage, has been excised at some point in the show’s history. The jaunty lyrics may be missed but the song’s absence does streamline progression of the early scenes. Sound design, by Steve Canyon Kennedy, is pristine. The music is enhanced by two percussionists on platforms flanking the stage; their playing creates a visceral, immersive soundscape that would be dramatically diminished if they were, somehow, housed in the pit. 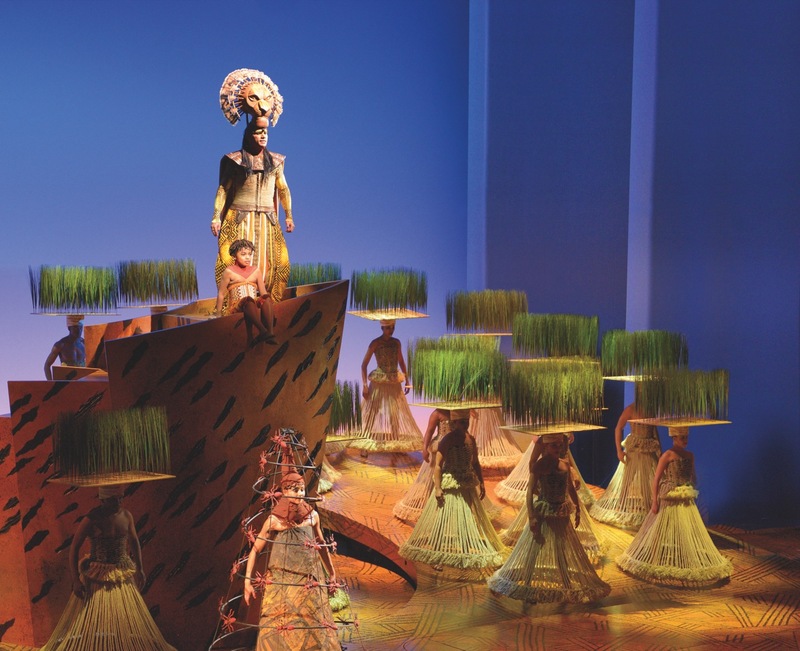 Richard Hudson’s scenic design appears as inventive as when first seen sixteen years ago. Lighting designer Donald Holder has arguably created the most beautiful lighting ever seen in music theatre, painting the backgrounds and bathing the stage in a sumptuous, ever-changing palette of purples, oranges, reds and blues. Such is the enduring quality of the production, songs and story, that it could be seen as “The Wizard of Oz” for our time. In other words, an enduring piece of entertainment that continues to enthrall and delight, with the added link of childhood memory for the parents now taking their children to see it. Indeed, the opening night audience reacted with rounds of warm applause as each character entered, and each big song began, as if greeting a treasured old friend. Associate director John Stefaniuk has invigorated the cast with the full energy and passion of the piece, with terrific use made of body language and physical contortions. Considering that the actors must manipulate masks and puppets, in addition to the regular skills of sing, dancing and acting, it is wonderful to see what a fine troupe of quadruple threats have been assembled for this new season. The performers come from a wide variety of nationalities, and Stefaniuk has them use their own accents, a decision that creates a raw, unpolished sound at times, but overall adds to the melting pot of character backgrounds on show. Adrian Pulvirenti gave an engaging, lively performance as Young Simba on opening night, with Ayanda Dladla a sassy, confident Young Nala. Buyi Zama captures the full eccentricity and wide-eyed spirit of Rafiki. 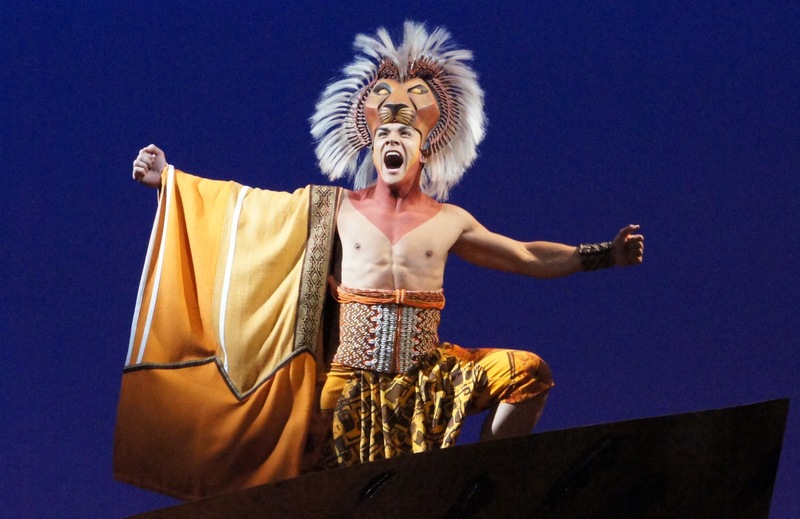 Rob Collins, freshly graduated from NIDA, has a strong and noble presence as Mufasa. Cameron Goodall channels the nervous energy and bristling indignation of Zazu into his puppet, keeping our focus on the bird not the man. Josh Quong Tart relishes the role of the villainous Scar, and is at his best when Scar releases the full power of his fury. While Roger Allers and Irene Mecchi’s book start out with a bit of a dry tone, the humour really picks up with the arrival of Pumbaa and Timon. Russell Dykstra and Jamie McGregor bring out all the hilarity of these beloved characters, and if there is perhaps one fart joke too many, there is more than enough love and good will. As the three laughing hyenas, Ruvarashe Ngwenya, Terry Yeboah and André Jewson manipulate their puppets with expert skill, achieving a terrific range of expression and creating three distinct characters as Shenzi, Banzai and Ed. 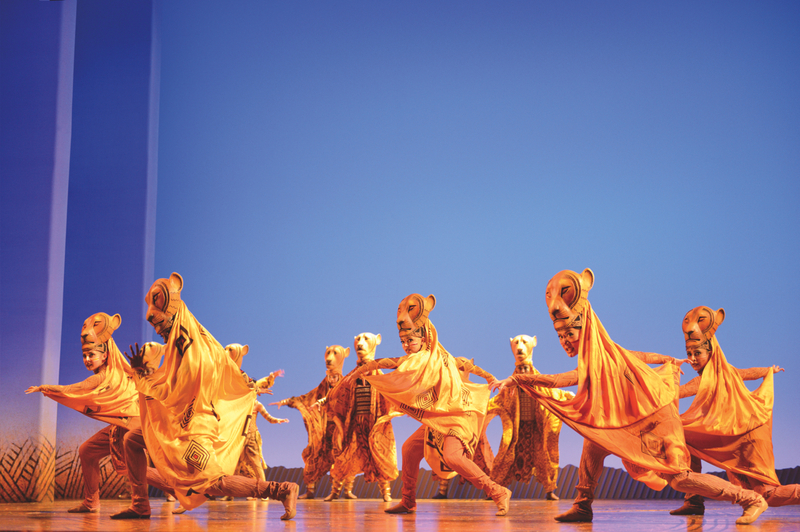 A true family musical, the new staging of The Lion King is set to captivate newcomers and delight long-term fans. Do whatever you can to secure a ticket. 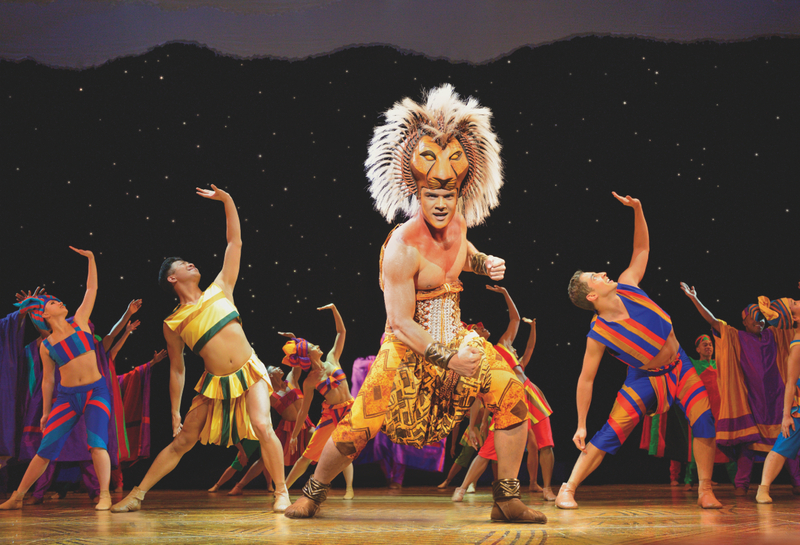 The Lion King plays at Capitol Theatre, Sydney. This review published on Theatre People 13 December 2013. You have to take your family to see it Mark! Although it is tricky given that it never seems to have any discounts available. Hopefully there will be a special occasion when you can see it at some stage. Thank you, good to know your thoughts on the performance. Are you a relative of Nick? I predict that he is going to be a big star! I hope you like the photo I took of him (photo #5 in this review) where he is doing his big roar! Hi Simon, Love the photos thanks. I’m dad, seeing it all unfold from far away in Samoa. Will be making the trek to Sydney sometime soon. Thanks again. Is Australia big on day seats at all (like we have a dedicated system here in the UK/West End, or is the House all sold in advance? Still trying to adjust to it not having the obvious range of the UK – know you have a lot more fringe etc. Next thing to check, Melbourne and Adelaide hehe! No, neither day seats nor TKTS are really on the scene in Australian theatre. There can be discount offers on shows that are not selling well, but there is usually a reason these shows are not selling well, if you know what I mean. Sydney has a few good smaller musicals in February/March – Sweet Charity, Falsettos and The Drowsy Chaperone. I can’t remember your exact dates but have a look into these. Email me if you would like to discuss more specifics and suggestions. My address in a comment from me on my About page. Woooow, i really want to see this show. When and where can i see it please? Are you also related to Nick Afoa? He is fantastic – what a star! Hope you have a chance to vista Sydney and see the show!